I guess so. Darling is going to Charlotte for a conditioning stint. He supposed to play on Wednesday. He had to agree to go down for the stint, waivers not required. 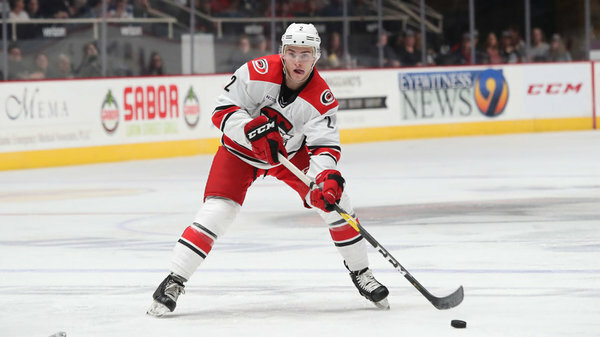 The Checkers have a busy schedule ahead of them with three road games this week, and the plan is for Darling to take the crease for at least one of them. “He’s going to play Wednesday then we’ll see what happens,” said Vellucci. Darling has stopped all 4 shots he faced in the 1st. Checkers up 1-0. McKegg scored, Potrualski and Smallman with the assists. Utica has had 2 PPs as well, just to add to how well the D is playing. Unfair to everyone else, they do have one NHLer and one, if not two, 7th/8th defenders too. Geekie makes it 2-0. Darling has stopped 6. Bishop makes it 3-0. Darling has 12 stops, end of the 2nd. Bishop may have injured himself on his goal. It was a breakaway and he crashed into the boards. Went off the ice holding his arm. checkers 3-1 win. Darling stopped 25 of 26. Either the Checkers took the foot off the gas and/or Utica finally started to play. Utica had more shots in the 3rd than the first 2 combined. Also the Checkers had 5 shots all period. If 14 shots is a storm, Darling weathered the storm in the third. Checkers have the best point percentage in the AHL. Bean’s goal against NHL netminder Cory Schneider, who was on a conditioning stint from the parent New Jersey Devils, improved the Checkers to 7-1-0 on the season, including a perfect 6-0-0 record on the road. Kuokkanen with 5 goals and a ppg. Look for him to be the next one up unless Roy ignites. 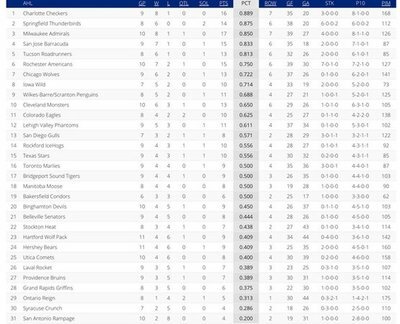 Also, Checkers are #1 of 31 AHL teams in the league in percentage of points won. Bean has goals on back to back nights. 2-1 Checkers in the first. Ned in goal and has made 4 saves. Checkers 4-2 after 2. Gauthier and Saarela added goals this period. Ned 15 of 17. 6-3 Checkers, final. Bishop adds the empty netter. Ned saves 23 of 26. Really appreciate these updates, along with the prospect updates. 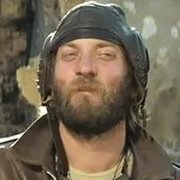 did anyone else see the video of Necas' goal from Saturday night? Can he score without falling down on the ice? 2 first goals, both while falling down. Thx for the updates, I like this thread! I really hate scratching Pu. Just saying. Based on the roster I see him battling Maenalenan for the last slot. 2-1 Checkers so far. Geekie and Brown scored, Ned stopped 2 of 3.